Located in the bottom half of the North Island of New Zealand, Wanganui is situated near the mouth of the Wanganui river on the West Coast. It is the hub of a busy Dairy cattle and sheep farming area and in recent years is becoming increasingly known for its forestry industry. 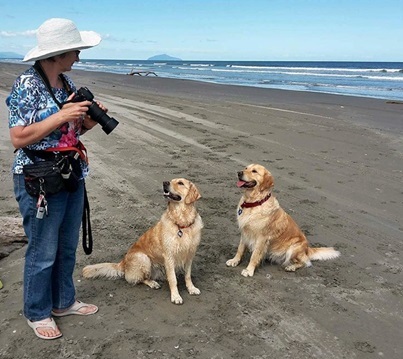 2019 Finds me recently retired from running a busy Boarding Kennel and Cattery in Wanganui for the last 14.5 years. I am looking forward to having more time to spend with my dogs and attending shows and visiting the local beaches. I live on a 1.25 acre block in Wanganui, so my dogs have plenty of room to run. Indulging in my hobby of amateur photography is something I’m looking forward to also. As with showing, I take the breeding side of my hobby very seriously and I am committed to breeding true to type Golden Retrievers with good temperament being my first priority. All of my breeding stock are hip and elbow scored and have annual eye tests. I have recently started DNA testing my breeding stock for 7 known inherited diseases that there are tests available for, PRA1, PRA2, PRCD-PRA, Ichthyosis and MD(muscular Dystrophy) and DM (Degenerative Myelopathy), NCL-GR (Neuronal Ceroid Lipofuscinosis) Has just been validated and all my dogs will be run through the new test ASAP Results are listed on each dog’s page. I place great importance on my puppies going to family homes where they are part of the family life. This includes a requirement that the puppy lives in the house, as proper socialization is necessary for a well-behaved dog. Golden Retrievers are bred as companion animals/retrieving dogs and as such, are happiest when close to their human families. Puppies are occasionally available to approved homes.